Railay is a promontory jutting out into the islands of Andaman. This is amongst the most difficult places to reach in Thailand. Railay has three spectacular seashores, famous rock climbing spots, and pristine mangrove forests. There are diverse restaurants and accommodation facilities ranging from budget options to luxury resorts that pamper you with each and every imaginable service and amenity. Railay can be reached by small longtail ferries from either Ao Nang Beach or pier in Krabi. These ferries depart when they have eight passengers on board. Visitors boarding at Ao Nang will often have to paddle the boat. Scheduled Railay ferries also ply between Railay and Krabi, Koh Phi Phi and Phuket. Railay is a peninsula surrounded by mountains and seas and the final access can only be achieved through a Railay ferry. Ferries depart from Ao Nang as well as Krabi on demand, making these places the getaways to Railay. It is also possible to reach Railay via regular ferries that run from Phuket, Phi Phi and Ko Lanta. These ferries are more frequent from November-May, which is the dry season. Timings for these ferries are available from local travel agents, or you can check their timings online. This is a fantastic sheltered beach that can be best accessed from Ao Nang. Fine sand in the northern end of the beach stretches all the way below water. This makes it perfect for crabbing and kayaking. Hotels and resorts here mostly cater to the affluent travelers, but there are also several affordable restaurants and bars offering spectacular views of the setting sun. This particular beach is located on the opposite side of the peninsula of Railay West and can be reached by walking on a footpath or by ferries through Krabi Town. The sand here is quite limited, and covered with mangrove trees. Railay East is not the best place for swimming and other water sports, but is the place to go to when looking for cheap accommodation, nightlife and a variety of dining experiences. The calm, clear waters are perfect for swimming, but there are better places close by for snorkeling and diving as corals and marine existence are not so plentiful right here. Two-person kayaks can be rented at several locations in Railay. Kayaking provides a different aspect of the limestone karsts around the peninsula. Some rocks have been eroded at their bases and have turned into sea caves. 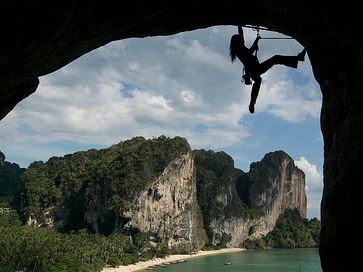 Railay is well known for its rock-climbing spots. Climbing schools offer classes for novice climbers. While Railay is primarily a destination for climbers and beach enthusiasts there are some interesting sightseeing spots available here. Diamond Cave is near Railay East. Visitors pay a small fee that allows them to walk the boardwalk where the lights reflect from the sparkling diamond-like cave walls. This is a small cave at the top end of the beach with a spirit house dedicated to Saint Phra Nang. Most people exit Railay as they came in. The Phi Phi Islands, Koh Lanta as well as Phuket are easy destinations from Railay by ferry, which can easily be booked through the hotel or an activity center.